I wish I had an interesting story to tell you about these cookies. But look at that picture. What could I possibly say to convince you to make these if that picture doesn’t already have you heating up your oven? BAH Note: Don’t go get in a hurry and forget to refrigerate the dough before you bake the cookies. Without the time to chill the cookies will spread too much. In the work bowl of a stand mixer fitted with the paddle attachment, cream together 1 cup of sugar and the shortening until light in fluffy. Add the molasses and then the egg, stopping to scrape the sides of the bowl down. In a separate bowl, sift together the flour, baking soda, salt, and spices. With the mixer on low, add the dry ingredients to the creamed mixture and mix until just combined. Transfer the bowl of dough to the refrigerator and chill for a few hours or overnight. When ready to bake, heat the oven to 375 degrees and line baking sheets with parchment paper. Place the remaining 1/2 cup of sugar in a small bowl. Using a small ice cream disher, scoop the chilled dough and form into 2 inch balls. Roll the dough balls in the sugar and place on the prepared baking sheets, leaving at least 2 inches between each cookie. Bake for approximately 8 minutes or until the surface of the cookie crackles and the edges become firm and crisp. Allow the cookies to cool on the sheet for 10 to 15 minutes before transferring to a wire rack to cool completely. I think these are the quintessential ginger cookies. I’m embarrassed to admit that I’ve had this recipe for YEARS and am just getting around to sharing it. my fave ginger cookies are the chewy kind, i don’t know why. the best part of tho is that these cookies are great as a snack with tea, after dinner dessert or before bed treat. These cookies are perfect with everything.� And since they are giants, one is really all you need at a time. I know you are dairy free but these would be spectacular with a scoop of ice cream. 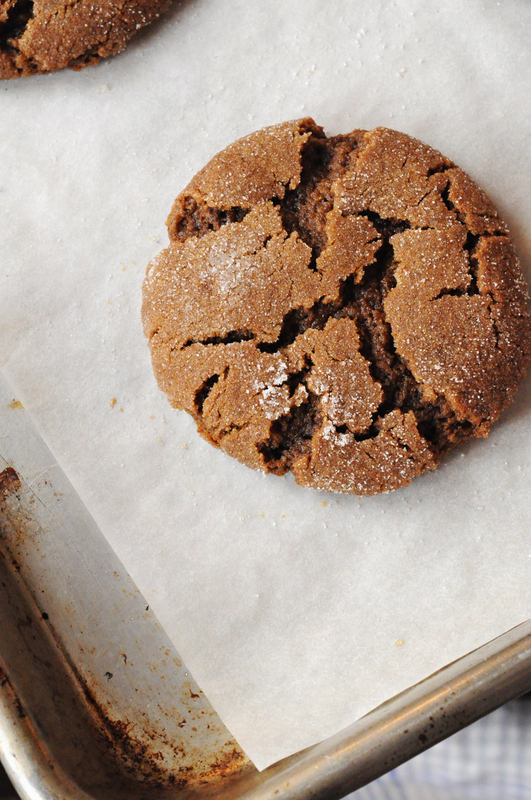 How did you know that chewy ginger cookies are my favorite cookie? I could eat a whole batch myself. Did you use granulated or brown sugar? I used white sugar but it would be interesting to see how the cookie changes by subbing in brown for all or part of the white sugar. Because the recipe uses shortening, these cookies are ideal for making ice cream sandwiches.� Even after the ‘sammy has been in the freezer to set up, the cookies will remain tender.� I’m already dreaming of ginger peach ice cream sandwiches! When i lived in Atlanta, the Flying Biscuit was my FAVORITE place to eat. Their drop biscuits were darn amazing (in my mind). Do they have any good stoup (stew/soup) recipes in that cookbook? Anne, I don’t have the whole cookbook.� Just this recipe.� I think I had the cut biscuit recipe once upon a time.� But this, this was the keeper for me. I bet you could find it on Amazon and “browse” through the index to see what kind of stoupy goodness they include.